Six time per year Lidl in the UK introduces its ‘Wine Tour’ with a special parcel of wines brought into store on a ‘when it’s gone it’s gone’ basis. Their latest Wine Tour launched on 24th May and wines are in store at time of review. I tasted a small selection, all of which are worthy of attention at their prices. 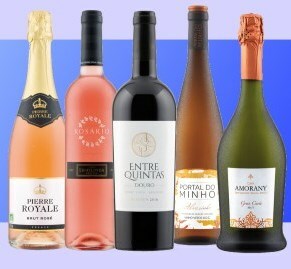 If I had to pick a favourite it might be the Amorany Cava, a traditional method sparkling wine of very good quality, but the Alvarinho and the £4.99 Portuguese rosé are more than acceptable summer quaffers. (2018) An interesting wine, produced by négociant Pierre Chavin, it is organically certified and made, so Lidl informs me, from 70% Chardonnay and 30% Pinot Noir by the charmat or tank method. It is Brut but tastes sweeter, and is crammed with soft, pulpy strawberries and berries, perhaps a lower pressure than most sparkling wines too, adding to the mouth-filling richness of easy-drinking fruit, but balanced and very summery. (2018) This blend of 30% Macabeo, 30% Xarel.lo, 30% Parellada and 10% Chardonnay was one of my favourites in this small selection, light in colour with a moderately persistant mousse, apple and citrus but also a touch of marzipan and something herbal - tarragon perhaps, and a touch creamy/biscuity. In the mouth soft and nicely balanced between fruit, more of that herbal tang and a citrus peel acidity. (2018) From the prime regions of Monção and Melgaço in the north of Vinho Verde country, this is Alvarinho, or Albariño as it's known just across the border in Spain. Pale green in colour, it has a crunchy apple freshness and a faint hint of salty sea breezes. In the mouth, a delightfully fresh and biting blast of citrus and apple is backed up with just a suggestion of creaminess and more texture than most Vinho Verde. Watch the video for more information and food matching ideas, and see our review of more wines in Lidl's summer Wine Tour 2018. (2018) Composed of 70% Castelão and 30% Aragonês, two grapes typical of the Península de Setúbal in Portugal, this is a dry and perfectly quaffable summer pink at a very good price. With only 10% alcohol the grapes have obviously been picked early to retain good acidity and freshness, but there is a summery red berry fruit and a hint of tobacco and dried herbs, finishing with a nice balance between strawberry sweetness and citrus acidity. (2018) A very typical blend of Douro grape varieties, 60% Touriga Nacional, 25% Tinta Roriz and 15% Touriga Franca, this spent 12 months in a mix of American and French oak barrels. Fragrant with balsamic notes, plenty of chocolate and vanillin oak showing, and lots of ripe dark berry fruits. In the mouth a big swirling pool of black fruits, for me just a bit too much oak giving a slightly resinous quality, but it's plush, deep, creamy and packed with fruit, and will find many fans especially if matched to venison, with a touch of bitter chocolate enriching the sauce perhaps. I’ve given up on lidl. Too often I’ve gone there to look for recommended wines and come away with nothing. Staff don’t have any idea about stock levels either. Seems a funny way to run a business. Thanks for the reply. Too low a proportion of wine loving customers, I suspect, meaning the stock is never delivered. See similar comments to mine on the Wine Society Community site. I’m sorry Tom, but I found the Entre Quintas Reserva to be undrinkable – a flabby, sickly-sweet oaktastic mess and what Jamie Goode would call a ‘spoof wine’. I realise 86 is actually a very low score by your standards but please call out bad wine when you come across it and don’t equivocate with phrases like ‘ for me just a bit too much oak’. Just give your honest verdict! Thanks for commenting Paul. I’m pretty happy that I described the wine accurately, saying ‘for me just a bit too much oak giving a slightly resinous quality, but it’s plush, deep, creamy and packed with fruit’. Does that equate to your ‘flabby, sickly-sweet oaktastic mess’? Well clearly not in your eyes, but your words are not words I would ever use in a tasting note. As I say in the TN, it’s a wine that I’m sure will find many fans – not me, and not you – but others will like the style more than us. With hindsight a score of 86 was too high, and that was a mistake. I was much more positive about other wines in the selection, so maybe a score of 85 or even 84 would have sent you the signal you needed. Now amended.